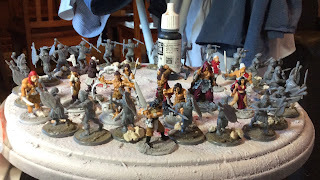 I have been making models, jungle bases and started some terrain for Ghost Archipelago. this has been a good opportunity to combine models from a number of different manufacturers and periods. I have been enjoying some Conan stories. Some of those books I have not read in 20+ years. I don't know how well they hold up in today's politically correct climate with impossibly muscled men rescuing impossibly beautiful women from impossibly evil wizards, or equally impossible monsters. However the tales make a good basis for scenarios for Ghost Archipelago, rival gangs of Pirates, Wenches and Rogues seek to relieve ancient temples of their treasures and woe betide any guardians that get in the way. I am also building some terrain out of polystyrene. What S&S adventure is complete without some dark ancient stone buildings. One of the Ghost Archipelago scenarios involves a ruined watch tower so I can use this to build one of those. I originally designed the building with vertical walls but it didn't look very good so I changed it to have sloping walls. Here is my temple building. It is now ready for some detailing and the some sand for texture. 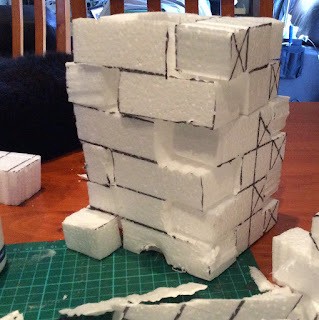 Here is the block work for the watchtower. I need to add a spiral stair around it. I also need to make a top gallery so people can be lords of all they survey. Here is Nile, helping do the terrain. She makes a good familiar. Here are some figures, these are a mix of plastic Zulus from Warlord games, some North Star Frostgrave models, and even a resin pirate from Black Scorpion. I also have the Sorcerer from Warlords of Erewhon. He could be a character or a vilian, maybe he uses my pyramid as a summer house for vacations. 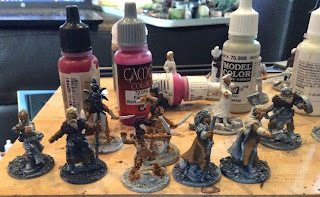 Here are some Lucid Eye Amazons hanging out with some Frostgrave Barbarians.